Finally I made it! Ever since I saw the pulled pork picture from here, it has been on my list for quite some time. I had some Chinese BBQ sauce in the fridge so I thought why not make it. Vietnamese cole slaw wasn’t in my original planning as I don’t expect my kids will like it, but I am glad I changed my mind the last minute– the slaw was very spicy (well, I added a little too much hot pepper here 🙂 ) and appetizing. It goes very well with the pulled pork. Season the meat with salt. Layer chopped onion at the bottom of a slow cooker, sit the meat on top of onions. Pour in root beer. Close the lid and cook the meat on high heat for 6-8 hours. For a faster cooking and better heat retention, I place 1-2 kitchen towel on top of the lid. Prepare BBQ sauce: combine all ingredients in a small sauce pan, cook on medium low heat until all combined and the sauce slightly thicken. Stir constantly. Set aside to cool. The sauce can be made days ahead and stored in the fridge. Prepare Vietnamese slaw: mix all ingredients with the marinade. Let it sit for at least 30 minutes before serving (see note below). When the pork is done cooking, drain the meat and remove any excess fat. Use a fork to shred the meat. Mix with as much BBQ sauce as you like. 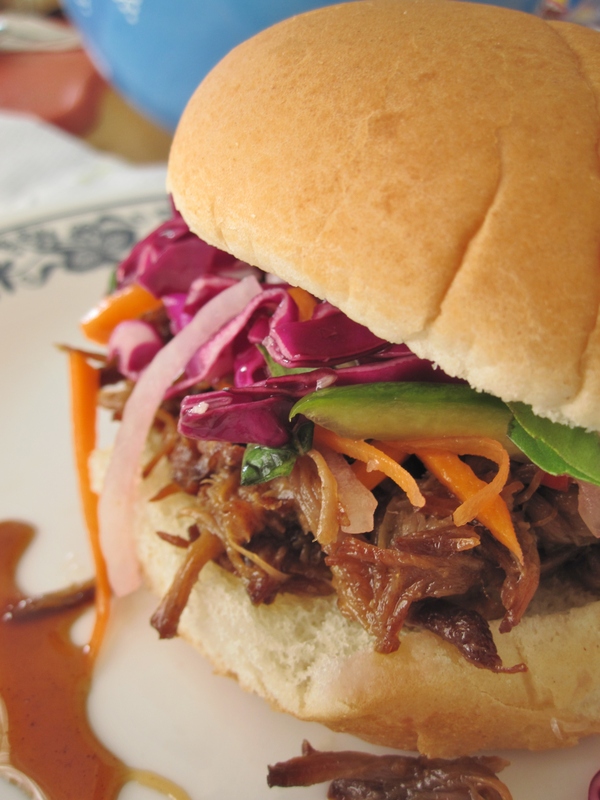 Put some pulled pork on hamburger bun and top with some Vietnamese slaw. Honey: If maltose 麦芽糖 can be found, use 6 tbsp honey and 6 tbsp maltose. Vietnamese cole slaw: The longer it marinates the better flavor it is. A lot of website recipes suggest marinating overnight for best flavor. But I suggest to use regular American cabbage if you opt for long hours of marinating, as red cabbage will make the slaw purplish/pink over long period of time.